I am yet to find someone who doesn’t like a Philly Steak And Cheese Sandwich. In fact mention Philly Cheese steak and I am usually asked if I know a great place to get one. No bias here..but you can guess my answer. 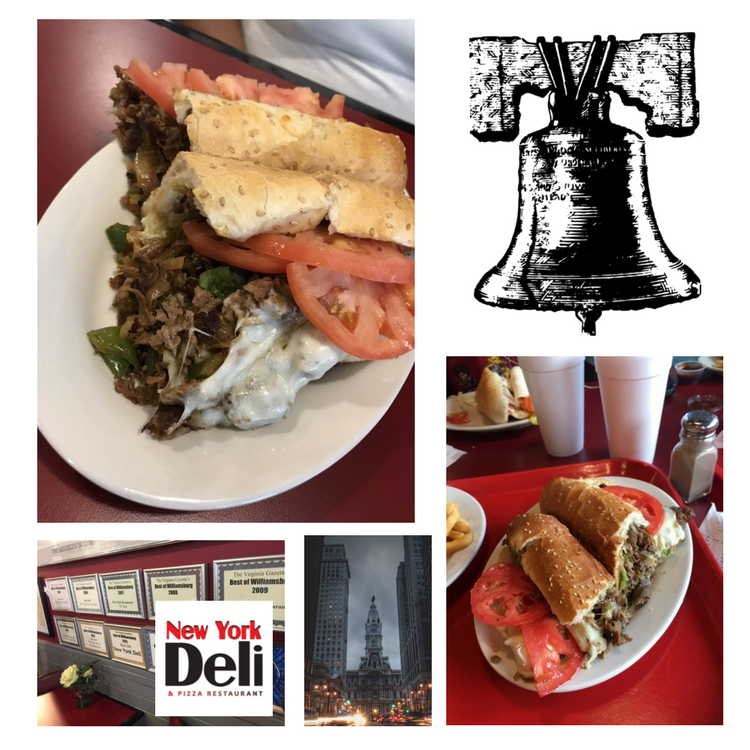 However before you think sandwich or restaurant nepotism is at work here I ask you to look at this New York Deli And Pizza Philly Steak n Cheese. Keep in mind this Philly Steak Sandwich you see here is not a model sandwich created for photography. It was not specially ordered just to be photographed either. This is the standard Philadelphia Steak And Cheese Sandwich ordered by a customer that we snapped it. And yes they ate it. With Philadelphia getting their first Super Bowl I thought this would be a good time to go over another Philadelphia institution. That institution is the Philly Cheese Steak. The Best Cheese Steak In Williamsburg may be a subjective thing. 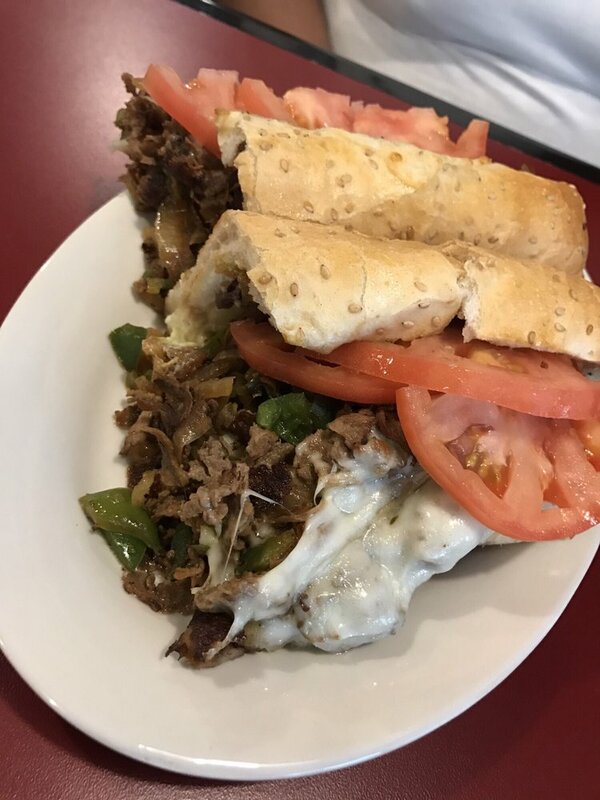 We do feel we have a strong case for why our restaurant makes the ultimate Steak n Cheese Philly. Biased or not our steak n cheese boasts of some over the top qualities. First we feel meat should be piled on and overflowing the bread. The bread is a suggestion of where the philly steak should stop and that is it. It is like a minimum line. The key is have it pouring over edge of the bread. A fresh baked hoagie is the only way to go. Bread is important to any sandwich. We are a deli, the bread is what complements the cheese and beef and has to be just the right thickness and must always be fresh. Cheese should be abundant. It should be mixed into the meat. And like the meat it should be flowing over the top. The sandwich is steak AND cheese. Cheese has to be represented properly. A Philly Steak is good in any temperature BUT it should be served piping hot steaming fresh. The heat releases all the flavor. That is how we do it here at New York Deli and Pizza. Just like all our sandwiches, it is made to order fresh. The gallery of pictures you see around are various sandwiches made right here in Williamsburg, Virginia. Notice the overfilled sandwiches. The mountains of meat and cheese. 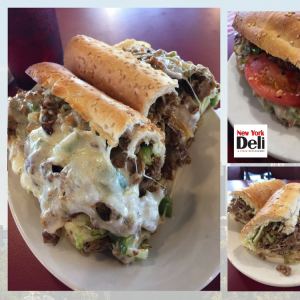 This is important because when you want a Philly Steak and Cheese, you want it done right. No this criteria might be considered a little odd. But I think a good cheese steak should be easy to find. We are right on the main drag near the Prime Outlets, the Wisc, and the Pottery. I cannot think of any reason not to order this but we do have a menu full of deluxe dishes and sandwiches should you have a steak n cheese dissenter. If you have room left we have the right desserts. Try our carrot cake or cheesesteak. Better yet, get it boxed up to take home to complete the cheese n steak experience. The combination of steak and cheese seem like they would have been inevitable but there is one specific origin point and inventor. The City..Philadelphia of course. The inventor was Pat and Harry Oliveri who stumbled across this dish in the 1930s. And it is a mainstay of delis and restaurants everywhere. There are even places who just sell cheesesteak. As I mentioned before we are the right place to start or complete your journey when you are visiting the Prime Outlets. You have walked tirelessly from store to store. You have spent lots of energy pouring through bargains. Now it is the right moment for a little me time. 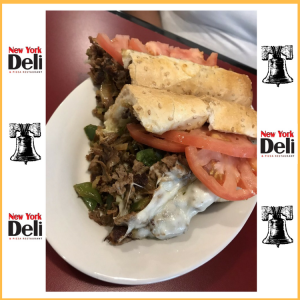 A little me time at our deli with our incredible Philly steak sandwich. Need a quick bite after hitting the WISC. 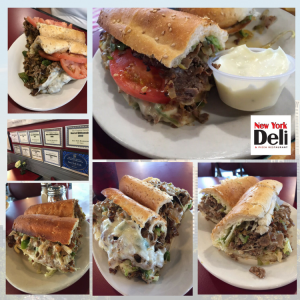 Call in your order and have a fresh cheese steak waiting for you and the family when you arrive. And if you visited the pottery, we are the perfect pit stop for a Philly sub after. Your Bibliography: En.wikipedia.org. (2018). Cheesesteak. [online] Available at: https://en.wikipedia.org/wiki/Cheesesteak [Accessed 21 Mar. 2018].